Once you have built the necessary records for your Word 2007 mail merge, you need to place the fields into the main document, by replacing the ALL CAPS placeholders you inserted earlier. Return to the main document (if necessary). Select the ALL CAPS text of a field placeholder. Or, you can simply stick the insertion pointer where you want a field to appear in the main document. Stick the proper field in the document. 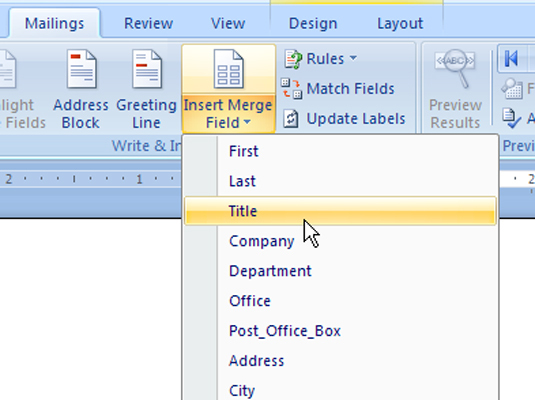 The Insert Merge Field menu displays fields according to the address list associated with the main document. Choose the proper field to insert into your text. For example, if you’re replacing the text FIRST in your document with a <<First>> field, choose it from the list. The field is inserted into your document and replaces the ALL CAPS text. You may need a bit of editing after inserting the field, such as adding a space, comma, or colon. Continue adding fields until the document is complete. Repeat Steps 2 and 3 as necessary to stick all the fields in your document. To delete an unwanted field, select it with the mouse and press Delete.